You have found the one and only website that praises John Ronald Reuel Tolkien, author of Lord of the Rings and other books, the way he ought to be praised. This is not just another fansite. You can be a "fan" of great men and women, but Tolkien was more than just a great man. He was a saint. It is my firm belief that Tolkien's works are Literal Truth. His writings are the light that leads mankind out of the dark tunnel of heathendom. We all must follow Tolkien, read his books, learn them by heart, chant them in public and fight against those who desecrate Tolkien and ridicule his works. My name is Noel Quickley von Schneiffel. Since my earliest youth, I have studied Tolkien's works, and he has enlightened me. Verily, Tolkien appeared to me in dreams and visions and made me his prophet. 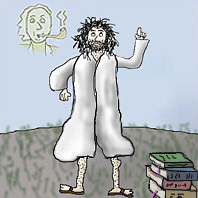 You might have seen me preaching Tolkien's truths on a street corner, or outside my desert cave. I'm easy to spot, since I always wear white prophet robes and wooden sandals. Me, preaching Tolkien's truths on a hilltop in my typical outfit. Note: Readers notified me of a faint apparition of Tolkien's head in this picture. Not everyone can see this, so if you do, congratulations! This website is designed to be a guide to your first steps to enlightenment. It presents my creative artwork, my analyses of Tolkien's texts, my autobiography, and much more. Take your time reading it, or - even better - switch your computer off now and read a Tolkien book. It might change your life, as it changed mine.